Amanda Holden’s lucid, poetic translation…. This was the first Handel opera Amanda Holden translated for ENO. 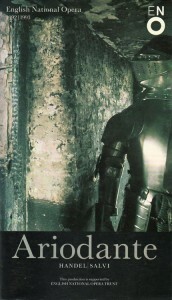 The production – a co-production with Welsh National Opera – was directed by David Alden and the first performances in 1993, starring Ann Murray, were conducted by Nicholas McGegan. The production has been revived several times – conductors have included Ivor Bolton and Harry Bicket; the title role has also been memorably sung by both Sarah Connolly and Alice Coote. All that’s good you would betray. All my joys you’ve snatched away.